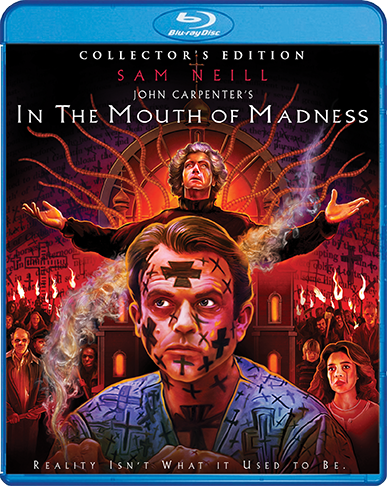 John Carpenter’s “In the Mouth of Madness” is one of my absolute favorites, and the Collector’s Edition Blu-ray takes my love to a whole new level. 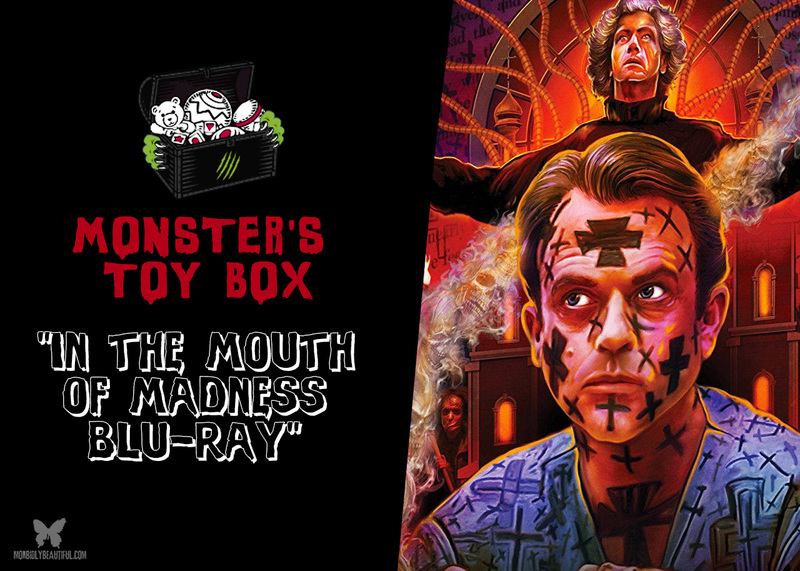 In this month’s edition of Monster’s Toy Box, I’m super ecstatic to be taking a look at the recent special collector’s edition Blu-ray release of John Carpenter’s classic masterpiece, In the Mouth of Madness. 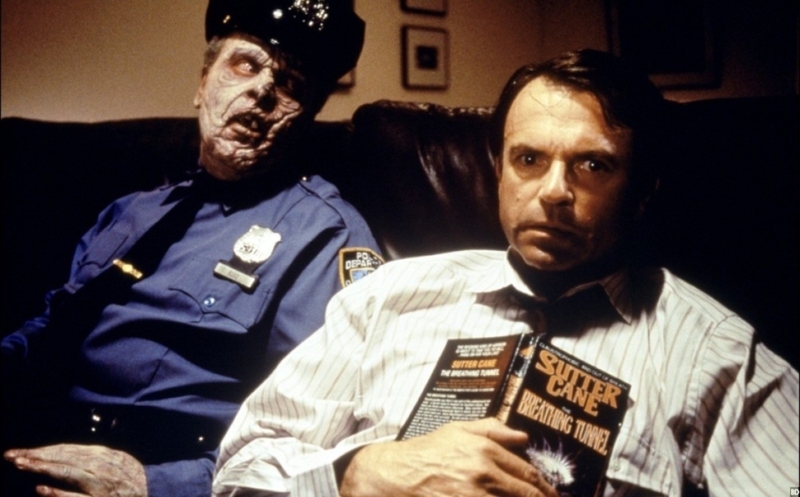 Feeling like a kid in a candy shop, this new Blu-ray release, of what many truly and deeply devout fans of the genre consider to be the pinnacle of all horror films, is jammed packed full of new and exciting extras. Not only does the stunning Blu-ray from Scream Factory boast an all new 4K scan of the original film elements, but it also provides an amazing all new commentary track which features John Carpenter alongside his wife, Sandy King-Carpenter. There’s also an additional commentary track with Carpenter and the films cinematographer Gary B. Kibbe. 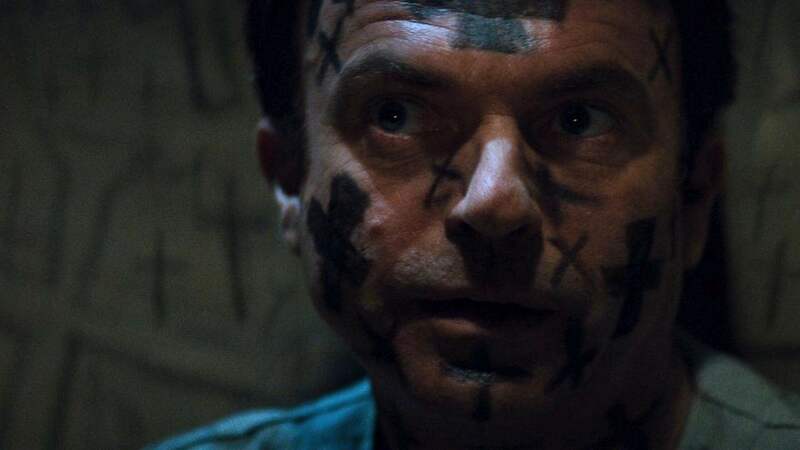 Along with the new commentary track, there’s a special feature called “Horror’s Hollowed Ground”, hosted by horror film buff, producer and actor Sean Clark. 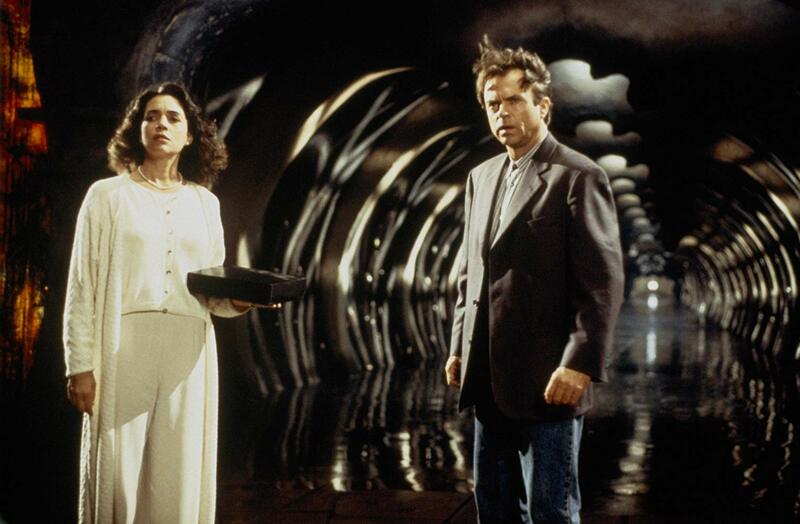 The Horror’s Hollowed Ground segment provides a current look at the films locations, in present time. 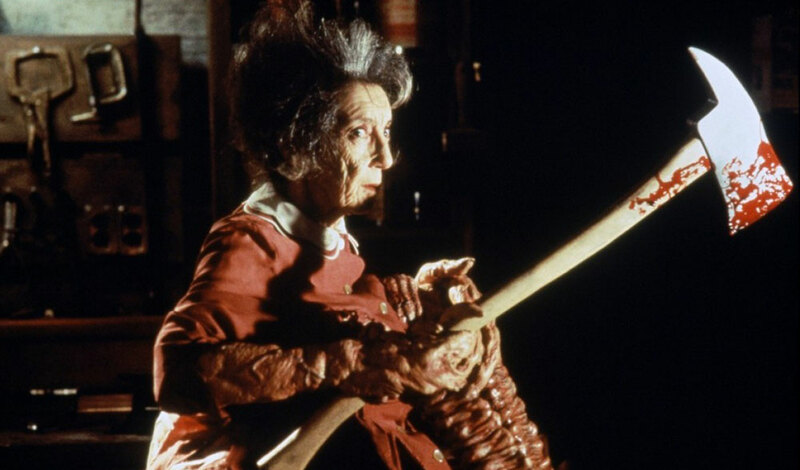 Clark takes you on location to the office of Jackson Harglow (Charlton Hesten), and to the Pickman hotel in Hobb’s End where the little old lady with tentacles (Francis Bay), chops her husband up with an axe. He also takes you to the awe-inspiring Black Byzantine church used in the film and even inside the movie theater where the final scene was shot. Another fitting special feature is the new “Whisper in the Dark” segment, where Julie Carman gives a jaw dropping interview about her time spent working on the film. She talks about working with John Carpenter and how he helped her adapt and find the base of her character. She talks about working alongside Sam Neil and Jürgen Prochnow and her relations with those fellow actors. She touches on how she watched Carpenter’s films, The Thing and The Fog, over and over, preparing for her role of Linda Styles. The interview provides a really in depth and extremely insightful look into how the characters and film came to be. There’s also a new special feature called Home Movies from Hobb’s End-Behind the Scenes footage from Greg Nicotero. It’s a very quick look at some of the footage captured behind the scenes, filmed during Nicotero and KNB’S time working on the film. It’s a really cool little feature, giving more insight to the film which has lacked extra content thus far. But the best thing about this new Blu-ray release, aside from the new 4k scan which really brings the film to life and makes it pop, is the new special feature titled, “Greg Nicotero’s Things In The Basement – A New Interview With Special Effects Artist Greg Nicotero Including Behind The Scenes Footage”. In that segment, we’re given an eye opening look inside the making of the grotesque abominations KNB fabricated for the film. We get to see how the wall of monsters and the few individual standalone creatures were constructed and brought to life by Nicotero and company. Before the film was released in theaters back in 1995, a special aired on cable showcasing the spectacular and disgusting monsters made by KNB. For years I searched high and low for a hint of that special, forever believing that In the Mouth of Madness was the film the monsters were from. The only detail my sibling and I could recall from the special, was that one of the creatures had multiple mouths with numerous sets of teeth and was called the meatball eater or something along those lines. When Nicotero mentioned the monster in the “Thing’s In The Basement” segment, saying he thinks they called it the meatball dog, a long awaited tear formed in my eye. I had finally found what I’d been searching for, for over twenty years. 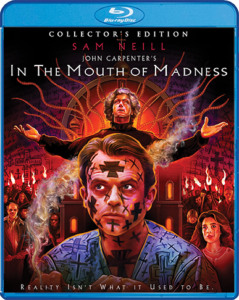 Overall, this film is, in the words of its Legendary director, “Horror Beyond Description.” With all the newly added content, this collector’s edition blu ray release of ‘In the Mouth of Madness’ is a horror lover’s dream come true. It’s the essential, must have disc for collectors and fans of this film. It’s the most complete release of the film to date, giving you all the madness your mind can handle. So, whether you’re a horror film junkie, collector, or just a fan of this film in general, do yourself a favor and grab your copy today.